Tonight the Los Angeles Dodgers visit Yankee Stadium in the Bronx for the first time since the 1981 World Series. Yes, the ballpark is a new one, and yes, this is a regular-season series, not one of the 11 Fall Classics in which these two franchises have participated, but there's plenty of history and interest there. 2,798 miles separate Chavez Ravine and Yankee Stadium. Up until the Dodgers left Brooklyn in 1958 only 15 miles separated the two perennial pennant winners. They are united in many ways by many things, and there's a visual connection involved as well—the Dodgers' iconic script jerseys and the Yankees' classic top hat logo were both commissioned by the same man. Larry MacPhail (1890-1975) was a Hall of Fame baseball executive and a legendary innovator. His most noteworthy achievement was bringing night baseball to MLB when he was running the Cincinnati Reds in 1935. MacPhail left Cincinnati in January 1938 to join the moribund Brooklyn franchise. The 1937 Dodgers had finished 33.5 games out that season while wearing kelly green. This account from Spring Training indicates that the 1938 club was planning on keeping green as their primary hue. MacPhail brought a host of changes to Brooklyn, one of the first of which was saying goodbye to green as the look of the Dodgers. The club hosted the Yankees in a preseason exhibition game on April 15 at Ebbets Field, wearing what the New York Times described as "the new road uniforms with the royal blue motif." Why the team was wearing road jerseys at home remains a mystery, but the fact is that the Dodgers have worn both home and road jerseys with blue script lettering ever since then. MacPhail left Brooklyn in 1942 and resurfaced three years later as a part-owner of the New York Yankees. His marketing efforts there included adding lights to Yankee Stadium as well as the commissioning of a club emblem. An article in a 1976 Yankees program describes the birth of the logo "as part of a post-war effort to beef up the Yankee advertising." The logo was created by noted sports artist Lon Keller. 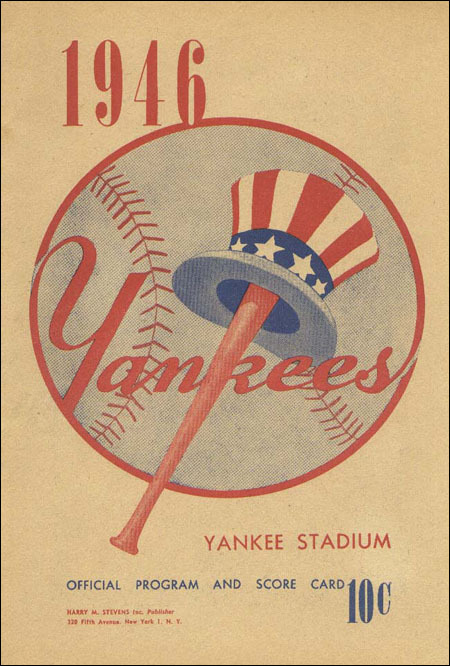 Preliminary designs were utilized on club publications for Spring Training, but the now-familiar mark made its debut on game programs early that season and has changed very little since then.